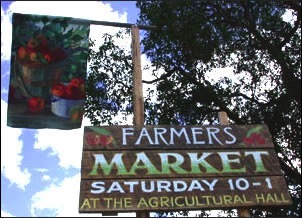 The Mayne Island community hosts a Farmer's Market in the Agricultural Hall Grounds in Miners Bay on Saturdays throughout the summer and early fall featuring home-made and home-grown products. At the market you can find locally produced vegetables, fruit, eggs, meat, fresh flowers, jams, plants, lamb's wool, goat's milk and cheese. Products available change with the seasons. You can also enjoy a tasty lunch at the market; Deacon Vale Farm offers home-made sausages, hot beef sandwiches, salmon burgers etc. Open Saturdays, 10:00am to 1:00pm, July through October. Agricultural Hall Grounds in Miners Bay, 380 Campbell Bay Rd.